Note that I am not justifying Nestle or Maggi. The point I am trying to drive is that as far as the common man is concerned, s/he is well aware that if you pay peanuts, you get monkeys. This is universally applicable to staff, products and services. When we go to the street corner to savor that bhelpuri, samosa, wada pav, chole kulche, we are well aware that quality will be a challenge. We attribute that to unorganized food sector and make our choice. Just because Maggi belongs to a brand like Nestle, it is creating news. Even that is fine but then one needs to also evaluate Yippees, Chingles, Feasters [Private Label of Aditya Birla Group], Knorr et al. Take any of these brands and the odds of them failing quality tests are as high as Maggi. Right now, my personal contention is that since the issue has cropped up, why single out Nestle alone. Subject ITC, HUL, Aditya Birla, MTR, GITS all for food safety standards. Since this issue has cropped up, let there be a fair evaluation of the entire sample space. We have had agitations with regards to pesticides in soft drinks, genetically modification in KFC. It will be in the news for sometime [till media keeps trumpeting it on prime time] and then fade away. 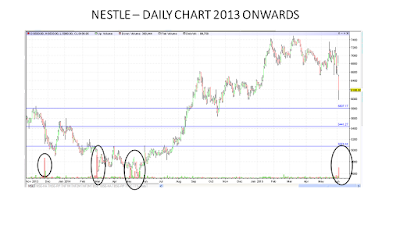 By 10th March 2015, Nestle stock was trading at 7500 clocking a 50% gain in 18 months. Yesterday's fall volume was about 400k shares. So there is some more downside pending as the volumes need to hit 750k to 800k shares. Technically, the critical buying levels are 5800, 5400 and 5000 levels. Of course the rally of 2014 had a sentiment effect with the new government and the next rally will not be that fast. However, just like the soft drinks and pesticide news, KFC and chicken news, this MSG and Lead stuff will be behind us soon. The stock will eventually reclaim old highs and perhaps attain newer highs of 10k levels. 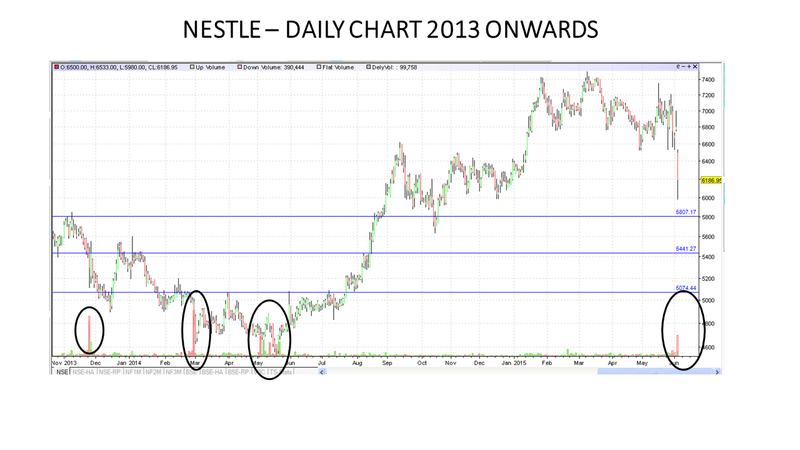 Since timing the market is next to impossible, this is a very good time to start an SIP on Nestle as the stock is poised to deliver 30% CAGR returns over the next 36 months. Stock has breached 200 DMA with conviction and historically when Nestle breaks 200 DMA with volume and momentum, it tends to spend about 6 months below that 200 DMA mark.